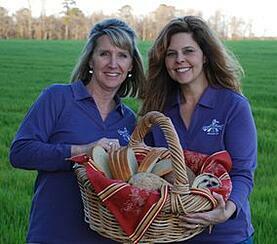 Goldsboro, NC, bread lovers only have a few more days to wait! Through the partnership of Tim & Melissa Taylor and Brian & Michele Jones, Great Harvest Bread Company is officially coming to Goldsboro, North Carolina on August 9, 2013! Melissa and Michele will be the primary bakery cafe operators and Tim and Brian will comprise their active support team. Melissa is originally from Laurens, South Carolina, and Michele is originally from Westerville, Ohio. Each moved to Goldsboro, North Carolina as a result of their husband's jobs. 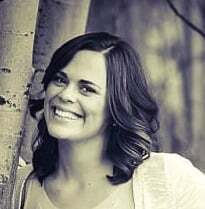 Melissa was a stay-at-home mom for 16 years before returning to teaching, and Michele was a teacher for 12 years when they both came together to be team teaching partners at a local Christian school. As they taught, their friendship flourished and they began sharing their dreams and goals. Harvest while living in other states, and knew the philosophies of Great Harvest would be the perfect fit for them and their families. They began discussing the idea together and their dream evolved into a reality. Melissa's husband, Tim and their three children, and Michele's husband, Bryan and their three children, are also very excited about this business opportunity. Their involvement in their community, schools, and churches will give them the perfect opportunity to serve others, give generously, and share the health and nutritional benefits of Great Harvest products. The ladies are excited to have an opening menu featuring a mix of Great Harvest beloved products — both new and old. 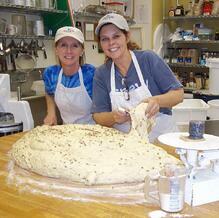 Breads will include traditional favorites such as Whole Grain Honey Whole Wheat, Farmhouse White and Cinnamon Chip. Other exciting breads will include Rosemary Bleu and Cheddar Garlic. They will also feature a variety of goodies, including the signature Great Harvest Oatmeal Chocolate Chip Cookie and Savannah Bar, and the full Great Harvest Sandwich lineup. Check out their Facebook page for more information about their menu and opening plans!